This is the first of a three-part series about the present and future of Korea’s global trade, marking the country’s achievement of $1 trillion in annual import and export volume, a milestone that only eight other countries have previously passed. ― ED. Korea has chalked up more than $1 trillion in annual cross-border trade transactions this year, a landmark reached by just eight other countries. 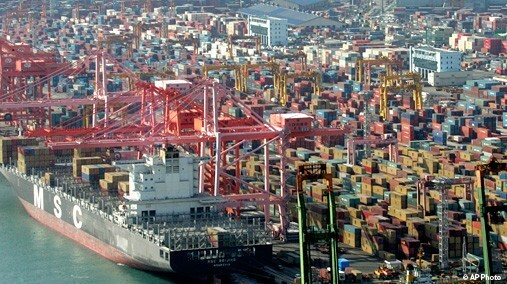 The Ministry of Knowledge Economy (MKE) said Monday that Korea surpassed $515 billion in exports and $485 billion in imports as of Dec. 5, for a yearly trade volume of $1 trillion. As a result, the country becomes the ninth member of an exclusive club following the United States, Germany, China, Japan, France, the United Kingdom, the Netherlands and Italy. ``This marks a historical event, which has been enabled by the efforts of our workers and people,’’ Minister of Knowledge Economy Hong Suk-woo said in a press conference. Originally, the Seoul administration expected that Korea would be able to top the $1 trillion plateau late last month before the Nov. 30 Trade Day since international shipments were brisker earlier this year. The pace has slowed somewhat since August due to the sovereign debt crisis in Europe and the resultant concerns of an international economic downturn. However, the ministry said that Asia’s fourth largest economy has been on the fast track in achieving the feat. ``In the aftermath of the global financial crisis in 2008, the world’s trade volume went down by 6.2 percent. In contrast, that of Korea increased by 4 percent,’’ Hong said. 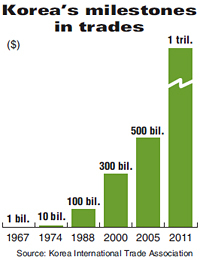 ``Plus, it took an average of 8.4 years for the $1 trillion club members to double their trade from $500 billion. It took merely six years for Korea to achieve that feat,’’ Hong said. He added that Korea has overcome a set of obstacles in becoming a titan in global transactions. Among the nine countries in the $1 trillion club, Korea is the second-smallest in terms of size of territory and population. The Netherlands is the smallest. When it comes to the global trade-national output ratio, Korea ranked second-highest at 87.4 percent. Only two other nations ― Germany and the Netherlands ― surpassed the 50 percent mark. In 1962 when Korea started its industrialization, the country ranked 104th in outbound shipments. Back then, its major export items were iron ore and tungsten. Currently, it stands at No. 7 and included in the state’s top products are high-tech products such as semiconductors, ships and automobiles. The nation is the No. 3 player in semiconductors and fifth-largest producer of vehicles. Semiconductors accounted for 10.9 percent of the country’s total exports last year, chased by shipbuilding at 10.5 percent, automobiles with 7.6 percent, flat-panel displays at 7 percent and chemical products, 6.8 percent. As of the end of the second quarter of 2011, Korea topped the podium in sales amount in a flurry of technology-intensive products such as ships, flat-screen TVs and cellular phones. Korea’s No. 1 export destination had been the United States, followed by Japan over the past few decades, but lately China has moved ahead of them to take pole position. As far as imports are concerned, raw materials, including crude oil accounted for 33.1 percent of overall imports last year since the country lacks natural resources. Hong said that Korea should not rest on its laurels and will keep advancing to climb the global ladder through more aggressive trading. ``Now, we have to think about generating future growth engines so as to charge ahead toward the $2 trillion era,’’ said Hong who took charge of the ministry last month. He added that small- and medium-sized enterprises also have to play a big role and the MKE will put forth efforts so that more and more small firms start shipping their products offshore.